Jidai Geki is a genre of Historical Fiction and Period Pieces found in Japanese Media. These works are set before (or around the beginning of) the Meiji Restoration when the Shogunate was deposed. The time subdivisions most often found in Japanese media include the Sengoku Period (or "Warring States", an era of civil war from about 1467 to 1573), the Edo Period (after Japan was united under the Tokugawa shogunate, 16031868),note For the curious, the 30 years in between those two is called the Azuchi-Momoyama Period; important in history, not so much in media. and the Bakumatsu/early Meiji Period (18531868, the part of the Edo Period leading into the Meiji Period, 18681912). Jidai Geki can be idealized or realistic, operate as rigorous Historical Fiction that show their work. It can also be like the American Western, soapy drama or hardass action, and feature a rich cast of character tropes. Jidai Geki that emphasize swordplay are often referred to as chanbara, especially the live-action movies, and counted on for lots of hot Samurai action (Ninja, Ronin, and Yakuza are also frequent players)note Although it's also been said that if a critic likes a particular film, it's jidai geki, and if they don't, it's chanbara.. Given the fact that there are plenty of Edo-era buildings in Japan still standing, and that Edo-era costumes are dime-a-dozen, that period appeals a lot to Japanese TV producers. Compare the sheer number of BBC costume dramas set in the Victorian era, or the innumerable Chinese films and series set during the Qing dynasty. The jidaigeki films considered most notable by Western audiences tend to feature Samurai, and from this they tend to assume that the term jidaigeki refers to Samurai films in particular. This is an exaggeration. Jidaigeki basically means historical settings or something set in the past, and does not by itself concern samurai or ronin by default. A number of jidaigeki exist that focus on women, on painters, actors, and even burakamin (the lower-caste Japanese underbelly who are the ancestors to Yakuza). In the classical era of Japanese cinema, jidaigeki was the most prestigious and serious genre. Also, while it may seem American and European directors have been borrowing (or, depending on your POV, appropriating) these conventions — sometimes whole plots — for years, Jidai Geki pieces have long borrowed in equal measure from Westerns and Film Noir. Akira Kurosawa himself was known to be a fan of director John Ford. George Lucas took some inspiration from this cross-pollination while writing Star Wars — guess where he got the word "Jedi". Even before that, jidaigeki borrowed and took inspiration from American films, like Stella Dallas (a popular melodrama in Japan), and also from European drama such as Henrik Ibsen and Leo Tolstoy. Kurosawa likewise also won fame for his transpositions of William Shakespeare to feudal Japan. Klingon society as seen in Star Trek: The Next Generation also took this era for inspiration. For Western depictions of Japanese history, see Hollywood Medieval Japan. See also Wutai for Fantasy Counterpart Cultures that are based upon Japan. Genpei War (11801185):note This is a pretty peculiar setting, because while most Jidai Geki media are set in Sengoku and Tokugawa eras (with a large and influential minority being set in late Edo/early Meiji Periods), when the Samurai class and its influence and customs were long established, Genpei War took place in the 12th century late-Heian era, that is, the High Middle Ages, when samurai were only a nascent community, widely derided as coarse and uncouth by the sophisticated court aristocrats. Works set in this period are usually to describe a rise to power by the samurai class and the societal change it brought. Mononoke skips around madly between the Sengoku and post-Meiji eras thanks to its immortal protagonist. None of said eras are particularly well-defined or historically accurate, though. Shura no Toki (mostly) self-contained story arcs is set in multiple periods, except Azuchi-Momoyama (yes, none of the Mutsu encountered Oda Nobunaga or his contemporaries). Well, except for one arc set in American frontier. Made explicit in Millennium Actress, which recounts the story of Chiyoko's life largely in the form of scenes inspired by her films. So the setting follows Japanese history from the Heian era all the way through to the modern world and even beyond into science fiction with callbacks to earlier eras embedded in some of the later ones. Lampshaded when a supporting character asks another "Aren't you dressed for the wrong era?" after a particularly abrupt transition. Sgt. Frog: The entire Musha Kero arc takes place on an Alternate Universe planet vaguely like ancient Japan. All the best-known Jidai Geki tropes are played straight, from the alternate Idiosyncratic Episode Naming to Keroro saying "Kore nite, ikken rakchaku... de arimasu." In universe example for Kamen Rider Double has Shotaro and Akiko become fans of a Jidai Geki series, including a themed dream sequence. Although set in the modern day, Kamen Rider Gaim seems to be taking influence from the genre: the Transformation Trinkets are called "Sengoku Drivers" in reference to the time period, and the Rider vs. Rider rivalries are directly compared to the time's civil wars, with one of the characters even pointing out how it's developing into a modern day Sengoku War. As the episodes go on, the tone begins to shift and the Sengoku War feel fades away. It doesn't go into obscurity, as the main character retains this feel with his Super Modes giving him a general motif. The backstories for Juzo and Daiyu in Samurai Sentai Shinkenger. The series as a whole uses tropes and conventions of the genre despite being set in the modern day. Akanesasu Sekai de Kimi to Utau is set in a separate universe that mimics seven eras of Japanese history, reaching as far back as Yayoi-Asuka period and as recent as Meiji-Shōwa period, along with Japanese Mythology thrown into the mix for good measure, compressed into a single world. The Cast Full of Pretty Boys the protagonist interacts with are established as similarly named stand-ins for historical figures of our world and have similarities in terms of personalities and backgrounds as their historical counterparts. Ikki, an early Sunsoft game set during some farmer's rebellion. Kenseiden in which Benkei shows up as a boss and the final boss is an indeterminate individual named "Yonensai". Ōkami: Sure it's an alternate world, but the setting clearly takes inspiration from Heian and Sengoku stories, events and characters. Deae Tonosama Appare Ichiban includes a rather insane mishmash of Japanese historical figures. Toukiden‎ has "Ages" loosely corresponding to periods of Japanese history from its legendary beginnings to the Meiji era. Toukiden 2 explicitly establishes the Awakening takes place in the Meiji period, with Western-style houses and ships in Yokohama before it's destroyed in the game's opening sequence. Touken Ranbu technically takes places 20 Minutes into the Future, but it involves going back in time to various times in Japanese history (from the Sengoku to Bakumatsu periods) in order to prevent historical revisionists from changing history. The characters, apart from the Featureless Protagonist, are Anthropomorphic Personifications of famous Japanese swords, ranging from the 10th to 19th centuries. Onmyōji is an interesting case. Being a Sino-Japanese game, it is guilty of both this and Hollywood Medieval Japan. In one of the missions from Carmen Sandiego's Great Chase Through Time, you have to help Murasaki Shikibu overcome her writer's block after the first chapter of The Tale of Genji is stolen by one of Carmen's thieves. Those Who Tread On The Tigers Tail, early Akira Kurosawa feature dramatizing the flight of Minamoto no Yoshitsune. Cosmos: A Personal Voyage recreates the battle of Dan-no-ura to explore artificial selection based on the resemblance of the Heike crabs to the Samurai. Amatsuki... well, the virtual setting at least. Miss Hokusai: Follows the life of Hokusai's daughter. Ooku: the Inner Chambers is an Alternate History (specifically, Gender Flip) take on this era, specifically from the reign of Shogun Iemitsu to, at this point, Iesada, specifically, right before Japan is forced to sign the Harris Treaty. Rakugo Tennyo Oyui, at the very tail end. The Kamen Rider OOO movie temporarily transports the main characters and a crowd of random people back to this period. Samurai I: Musashi Miyamoto actually starts at the tail end of the Sengoku period, showing the Battle of Sekigahara that ended the shogunate wars, and then continues on to the start of the Edo period. Silence by Martin Scorsese which adapts a Japanese novel about the failure of the Jesuit mission. Zatoichi. The 2003 version, in particular, is set at the tail end of the period (if the presence of a civil warera revolver is any indication). Young Samurai, which is set during at the end of the Sengoku and beginning of the Edo Periods. Juken Sentai Gekiranger. At least for two episodes. Ganbare Goemon, though the later games became heavily anachronistic. Kanshakudama nage Kantarō no Tokaidō Gojūsan Tsugi, a Sunsoft game for the Famicom based on a famous series of woodblock prints from the period. Kid Niki Radical Ninja. The type of oval coins dropped by one enemy are specific to the Edo period. Rurouni Kenshin, a deconstruction of the genre itself. Bakumatsu Rock, naturally, but with rock bands! 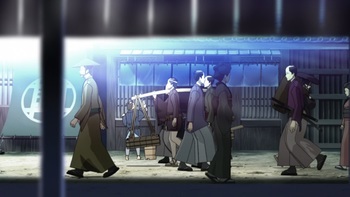 The Last Blade, as told in its Japanese title of Bakumatsu Roman: Gekka no Kenshi ("A Bakumatsu Romance: Swordsmen in the Moonlight"), and evidenced in many visual elements in the game.